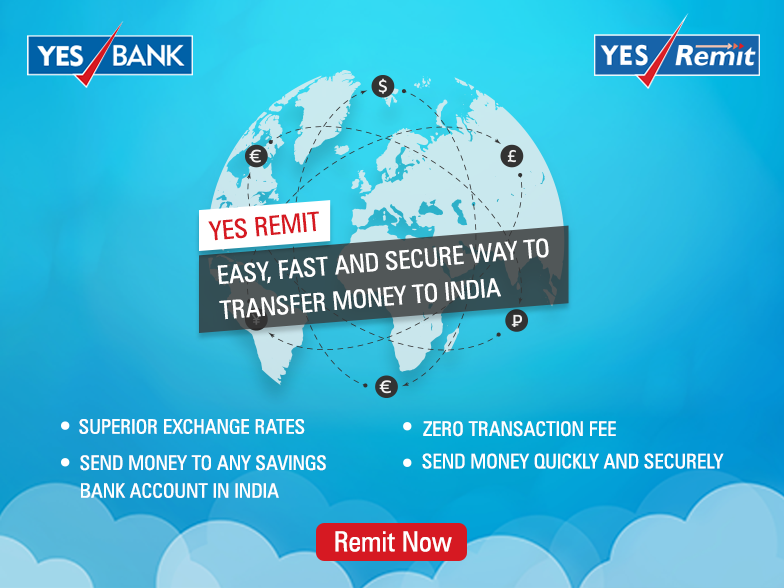 All the useful information that you need to know before sending money with YES Remit! You can transfer this amount through bank transfer, wire transfers, cheque deposit and remittances through exchange house. Only Indian citizens or OCI/PIO holders can use the services of the company to send money to the beneficiary in India. The company is not offering forward contract, spot and third party transfers to its customer which is a major drawback. Besides this, it offers free transfers to the people and also provides 24/7 customer support. YES Remit is highly secured, so one can transfer funds worry free. So, on an overall basis, we rate it 7.5 out of 10. Pricing : How much does YES Remit cost? The company does not charge any transfer fee from its customers. So you can transfer the funds for FREE. The company charges, exchange rate lower than the actual market price which is shown as indicative price during the transaction. The actual rate that is applied to the money will be based on the rate prevailing on the day your funds are converted into rupees. Under the pricing head, we rate it 8 out of 10 because it has not fixed the exchange rate as money transferred will not be the exact amount shown at the time of transfer. Transparency: Does YES Remit have any hidden fees? The company does not charge any hidden fees from its customers, but if there are any taxes levied by the transferred countries, then it may reduce the amount. One can track the transactions directly on their dashboard by logging into it. There is no direct process to track the transactions. Under the transparency head, we rate YES Remit 9 out of 10, because it neither charges any hidden fees and good tracking procedure. Transfer Speed: How long does it take to send money through YES Remit? The company takes 3-5 working days to transfer funds in foreign currency cheque and bank account to bank account transfer. While if you are transferring through Wire transfer, it will be credited in 24 to 48 hours to the beneficiary account. YES Remit is also offering remittances through exchange house - GCC region, which takes at least 2 hours or more in transferring funds to YES Bank account. Therefore, under this head, we rate it 7 out of 10, because it is not offering instant transfers as offered by many of its competitors. Security : Is YES Remit Safe? When you pay through YES Remit, the money is transferred through the Electronic Clearing System (ECS) in your sending country to the designated account held and operated by YES Bank. Thus, money always moves within the banking system. All transactions and information exchanges happen on fully secure encrypted lines and your data is stored on servers that are protected by advanced firewalls which have undergone extensive security tests. Therefore, we rate 10 out of 10 to YES Remit under the security head. The user can contact with YES Remit customer support assistance 24/7 at its toll-free number or can write them at the email. The company is offering both Android and iOS mobile apps for its users which they can download it here. The company provides multiple referral benefits if the person referred you have transferred amount through it. You can get exciting vouchers of SAAVN, Magzter and Uber on every referral. The company provides promo codes through notifications, email and SMS to customers, which will help them to provide better exchange rates. As per user experience, we rate YES Remit 8 out of 10 as its services are available in a few countries only. This depicts that it has vast opportunities to grow to become the top money remittance company. If you want to use the remittance services of YES Remit sign up here. Coverage: How many Countries & Currencies does YES Remit support? There are many more countries and currencies, which are needs to be covered by YES Remit where most of the Indians live and use the transfer services to make the transfer to their families. Therefore, we rate it 6 out of 10 to it. If you live in the above countries and want to send funds with YES Remit login here. Go to the YES Remit website. Select the country from which you want to send funds to India. It will show the indicative and fixed rate. Enter all the details as asked by the company which will help in transferring. Worli, Mumbai - 400 018, India.